One of my very favorite things about being vegan is creating new desserts. I’ve found that baking with coconut oil, applesauce (or other fruit purees), and even flaxseed to replace eggs, butter and milk is a great way to get flavor and texture without all the fat or calories. And you can greatly reduce the sugar in your recipes if you use natural sweeteners like coconut palm nectar, agave nectar, or coconut sugar. 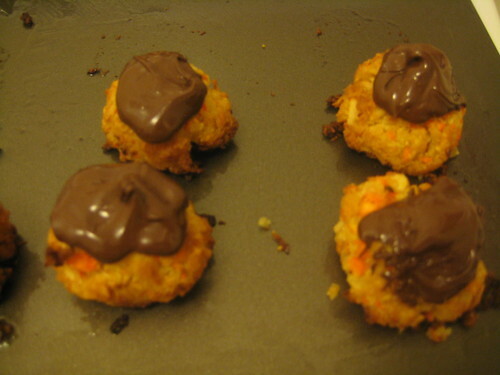 My vegan chocolate coconut macaroons are one of my all time favorite creations as they are rich, delicious and flavorful and perfect for any occasion. Nobody will ever suspect these tasty treats are vegan. Preheat the oven to 350 degrees. Mix all the ingredients together except for the chocolate in a large bowl. Lightly grease a cookie sheet (I just rubbed on a little more coconut oil). Pat mixture into 24 balls, slightly smaller then golfballs. Place balls on pan 2 inches apart and bake for 30 minutes. Meanwhile, melt the chocolate chips in a saucepan over medium-low heat. Drizzle or in my case DROP a little melty chocolate on the top. And Voila! This entry was posted in Desserts, Recipes, Vegan Recipes, Vegetarian Recipes and tagged baking, health foods, healthy desserts, raw foods, vegan desserts, vegetarian, whole foods. Bookmark the permalink.